If you are as old as I am then you will remember the title even if you have not read Robert Pirsig’s seminal work, Zen and the Art of Motorcycle Maintenance. In it Pirsig describes a journey he and his son make from Minnesota to Northern California and the book among other things explores the meaning and concept of "quality". A term he conceives ultimately as undefinable but he feels is a sensation that exists between the subject and the object. His hypothesis being that to truly experience qualitywe must both embrace and apply it as best fits the requirements of the situation. So what has this trip down memory lane of books I read in the 1970’s have to do with running or triathlon? As a Coach I often hear athletes effectively talking about the quality of their workout. “That was a great run” or “that was an awful swim” but what are they using to define that quality? More often than not they are looking at times and distances. If the set workout was an 8km run at 5 min per km pace and they run at 5:10 per km that can be viewed as lesser quality - and even for some athletes as failure. However if they ran it at 4:50 min per km they may view that as success - however it is as far from quality as the 5:10 if the aim was to run at 5:00. To consider the quality of our workout perhaps we need to look not at the subject and the object but to consider the sensation in between. I’d counter that if I go for a beautiful run down by the River Tay, and enjoy the experience but run 5:10 then argueably that has greater qualitythan going out and battling to maintain a 4:55 min per km pace. Whilst we are on the Zen pathway we should consider the concept that almost every martial artist knows something about, the Chinese theory of yin and yang. Chinese philosophy perceives the universe as the interaction of complimentary opposites such as day and night, male and female, hard and soft, life and death, yang and yin. The dynamic cycle of creation and destruction, embodied in the life cycle of a flower, is seen as a continuous process of change. I believe it is helpful as an athlete if we can view our workouts as this continuous process and to allow for and accept this ebb and flow without fighting against it. So if you are fixed, as many westerners are in concepts such as black and white then starting to grasp the theory of yin and yang will help to serve that gap and to allow you to see the flow that exists in your training from time to time as the natural order of things. The next time you do a workout consider that space between the subject and the object to truly comprehend the quality of the session and allow for that yin and yang flow. In Part Two of her article, Kim Keegan discusses the detachment, discomfort and humour that was required as part of a 14-member group that set out on a 30-day trip into the Himalayas included an attempt to summit Mera Peak (6,476m), a cross over the Amphu Labtsa pass (5,780m), and the final summit of Island Peak (6,189m). These ideas are very much applicable to all aspects of endurance sport and may be applied to your own performance-related goals. 1) Allow yourself to be vulnerable.It was taken for granted that on a trip of this nature each of us would face daily personal battles however we did not predict how differently these would manifest in each of us. While some doubted their fitness, others struggled with the distance from loved ones. Physical strength, motivation and resilience will naturally ebb and flow. Personally, I learnt that in the times you need help - take it. Similarly, if someone needs your support - help them. 2) Detach (somewhat) from home.For the first three weeks, team members were focused on the task at hand. However, there came a time for each of us when we seemed to allow our thoughts to become preoccupied with the family, home comforts, work or troubles we had left behind. This shift was clear to see, it was as though people had physically turned around in their mind and started their journey towards home. Try to ensure this happens at the moment of your choice. Before this point allow home comforts - music, pictures, family – to provide enough meaning to carry on but not too much to change your mind! 3) Accept discomfort.To resist something will only give it more power to eat away at you. This may be physical fatigue, a frustrating team mate, or an indefinite wait. Our daily personal limits fluctuated depending on a range of different factors. However, it seemed that those amongst us who expected a certain level of discomfort could more effectively embrace it when it occurred. 4) Find humour and capitalise on it.One thing this experience showed me is that suffering and happiness can occur in close proximity to one another and may even rely on one another. The extent of the oppressive bitter cold could be fully appreciated with the contrast of the warm dancing sunlight. In a situation where risk and hardship were dominant it helped to compliment the serious with the silly. 5) Be willing to learn.It is through testing ourselves that we can learn to fully know and trust ourselves. However, with every test comes the risk of defeat. Perceived failure can bring up difficult emotions and reactions in all of us. The month was a rare opportunity for each of us to dedicate a significant amount of time to look towards ourselves and ask important questions. Don’t be afraid to be honest with yourself about the things you find challenging. Exposing yourself to failure is an admirable endeavour and one that can grant you access to untapped potential. If you would like an initial consultation with Kim then please just contact us here. 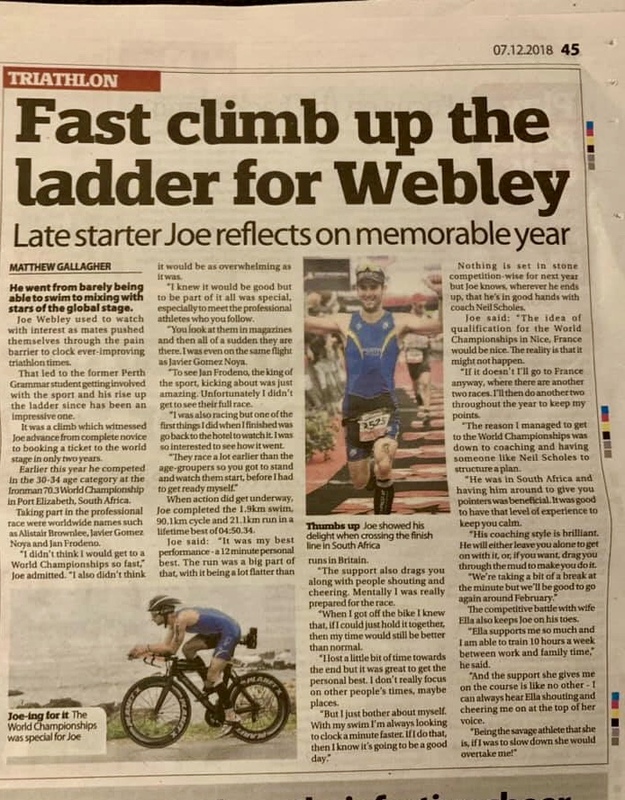 Great full page article about one of our athletes Joe Webley and his rise to success. Plenty more to come from this athlete. It’s always humbling to get a mention in these pieces. For the ambitious athlete with equally ambitious training consideration should be given to their motivation and their specific goal. A solid motivation is to concentrate on the process and not the outcome and aim to be the best that athlete can be and the goal should be whatever target the athlete places the greatest value on. With runners and triathletes I would encourage them not to place too much emphasis however on the goal too early in their athletic career. It takes time to achieve appropriate levels of sport specific excellence and athletes should be allowed this time to develop, grow both physiologically and psychologically and potentially change direction. In terms of the objective it is key that one should never do more than is necessary to achieve it. So programmes should not just build to a maximal training level and hold an athlete there, rather any programme should take into consideration all aspects of an athletes life, work, family and social commitments and ensure that there is a quality to the training that is fitted in around these aspects such that the athlete develops. So when one looks into the specifics of training whilst mileage volume at a slower pace is needed to establish the cardiovascular base required by the aerobic sports that most participate in it should be limited to again being just enough to achieve the aim and no more. More is not necessarily better – for the triathletes I am tempted to repeat that! The risk of any over use injury should always be limited. When we conduct anaerobic work or the powerful stimulus of interval training it can quickly bring an athlete on but equally quickly can bring about fatigue and injury so it is monitored and used sparingly – no more than necessary for the individual athlete. The harder the training or the greater the ambition of the athlete the more a Coach has to consider. Athletes should be encouraged to appropriately discover their limits but this must never be at the risk of pushing an athlete too far and if the mantra of Never Do More than is Necessary is heeded you give the ambitious athlete the greatest chance of reaching their goal. Performance in the majority of endurance events is in the main determined by the maximal sustained production of power over the set competition distance. So to achieve a performance of running a sub 40 minute 10k you need not only to be able to be able to run sub 4 minute km pace but you need the trained energy systems in place to maintain that pace and power over 10km. At the end of the day it is the athlete that covers the set distance in the shortest time possible that wins the race. To achieve the best result requires an athlete to be in the best physical condition for the event and indeed many studies conclude that this it is this pure physical conditioning that is of primary importance. To achieve this level many aerobic endurance athletes look to copy programmes from other successful endurance athletes or to select a generic plan from a magazine. This may actually be successful, if you are lucky and if your strengths and weaknesses exactly match the successful athlete’s programme you are copying. A better strategy would be to have a specifically designed programme constructed that is based on solid training practices and the principles that will bring about success. I further discussed Specificity of Session in this article. The first part of any plan when it comes to physical conditioning for Endurance Events involves building that very endurance that the athlete needs. This concept has been utilised I suspect by about 95% of the most successful athletes. Working daily with athletes I see the need to emphasise this endurance prior to working the speed endurance but this is not a new phenomenon. Indeed this approach was used by Walter George – who I hear you ask? – well Walter George was the world mile record holder back in 1896, but, as reported by Steve Ovett’s Coach it is an approach that has been used successfully through the agesfrom Sydney Wooderson (world 880 yard and mile record holder in the 1930s) through to Arthur Lydiard’s group in the 60s and 70s and indeed by Ovett himself. It takes a long time to develop endurance which is why we stress it first and foremost and recommend a long, gradual build up in the first stage or a training plan. It is no good being fast in April or May if you can not hold that pace because you are short of endurance. The first priority in any endurance race is the ability to last the distance at a good pace. By working your endurance you will improve your oxygen uptake and this factor alone will mean you are better equipped to tackle the speed/endurance phase so particularly at this time of year in late January don’t forget that endurance aerobic work. Astrand, P.O., K. Rodahl, H.A. Dahl and S.B. Stromme. Textbook of Work Physiology 2003.